This day was spent on Desert View Drive, a 25-mile scenic route along the rim to the East entrance. It also includes a stop at the Tusayan (Ancient Pueblo) Ruin and museum. But first...the following 2 cute animal pictures are for my frienf Mary Ann, who delights me daily with cute animal pictures on Facebook. This cute chipmunk found a way to my hanging bird feeder with a very long stretch. We started by driving the whole 25 miles to the Desert View Visitor Center and Watchtower. Then we made our way back slowly, stopping at the points of interest. From the distance you can see the Watchtower, overlooking both the canyon and the Painted Desert to the east. 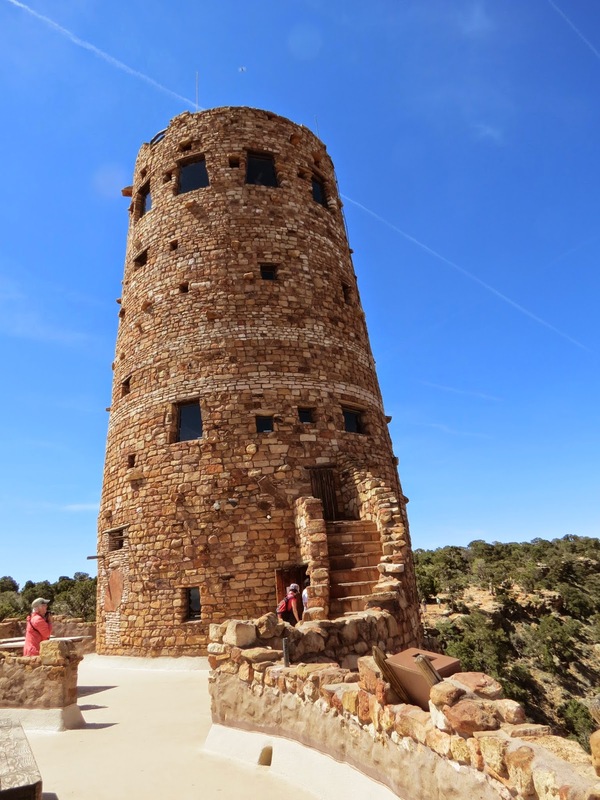 Built in 1932, this 70-foot tower is the highest vantage point on the South Rim. The tower is just a short walk from the Visitor Center. It was here that I was introduced to architect Mary Colter, who not only designed this building, but several others at Grand Canyon. About Mary Colter. Quite an accomplishment for a young woman in the 1930s. The design of the tower represents her research and imitation of ancient indian dwellings, as well as attempting to blend in to the surrounding landscape. The large room to the right represents a Kiva. It houses the gist shop, but there is a large viewing area on top. View looking east toward the Painted Desert. You can see the river from here too. This sign tells of the day in 1936 when two airlines crashed over the canyon, with all lives lost. 28 unidentified bodies from the crash are buried in Canyon Village Cemetery. The bodies were removed, but the debris is still out there in this remote area of the canyon. The rock layers really show up on the sheer cliffs. Those stairs lead to a sealed door, but we will go in another door and climb the tower. 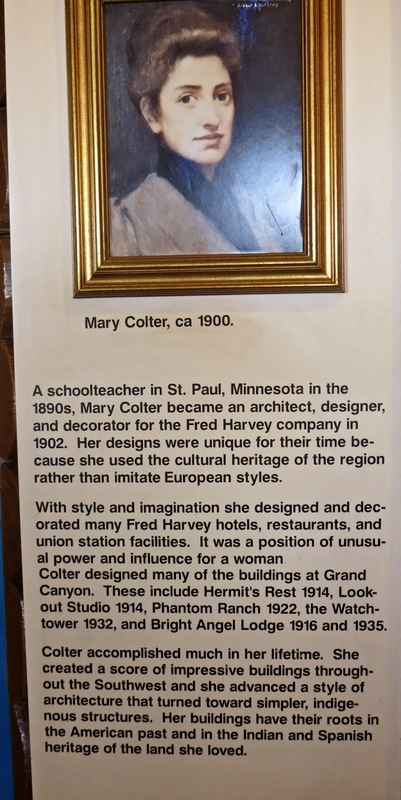 Mary Colter used Hopi Indian artists to paint the historyof their people on the walls and ceiling inside the tower. The chairs were hand made by a former forest ranger. Top level. There are more stairs, but we were not allowed to access the roof. Views out the windows. If you squint, you can see the snow-capped San Francisco peaks on the left. I love the colors of the canyon here. Imagine running these rapids in a raft. Our next stop was at Tusayan Ruin and museum. 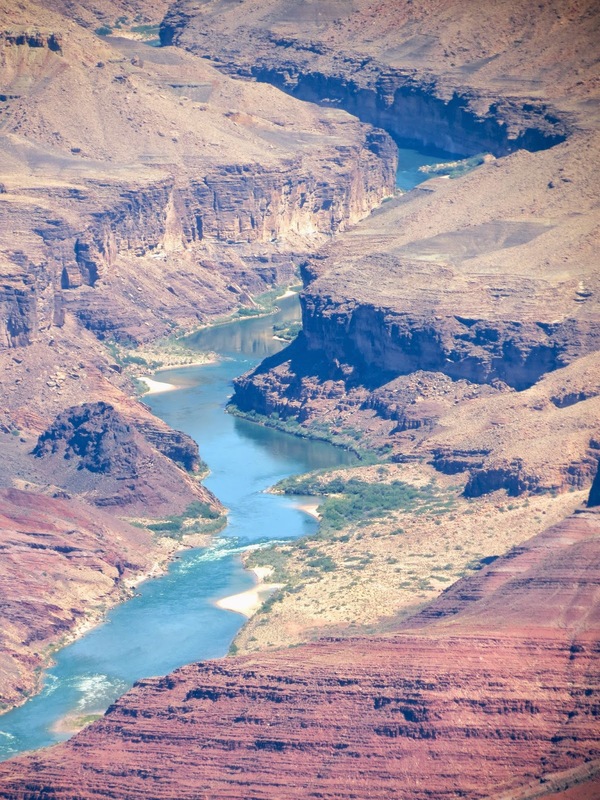 There were several groups of ancient Indians that lived along the rim and inside the canyon. This familial group of 20 to 30 people lived here about 1185 A.D.
A painting inside the museum depicts what the ruins may have looked like, and what life may have been like for them. Artifacts found here are on display too, and give more clues to how they survived. This basket coated with pine pitch was likely used to gather and store water. Diagram of the ruins. No attempt has been made to reconstruct the buildings, what you see is what remains. Only part of the ruins have been excavated. The storage room and kiva on the right have not been excavated. They have been left that way on purpose to preserve the ruins. Overlooking the living quarters. Mostly sleeping took place there, perhaps 4 people to a room. Daily living activities took place in the open plaza area outside. We didn't see this gopher snake here, but we did later at one of the overlooks. 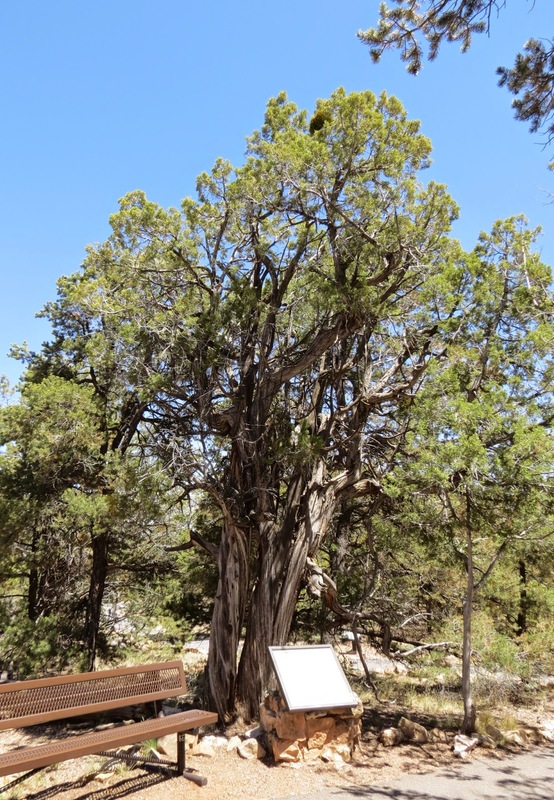 Utah Juniper: used for building materials, fuel, berries eaten, and bark for bedding. These smaller rooms were likely used for food storage. Diagram of the large Kiva. The smaller (older) kiva and more storage rooms have not been excavated. They had a great view of the San Francisco Peaks from here, and they likely held some spiritual significance for the Indians. The Tusayan people farmed corn and beans, and relied on local plants and animals for food. Big Sagebrush leaves were boiled for dye, bark woven into baskets, leaves burned for cleansing during ceremonies. Mormon Tea: needles brewed to make tea. 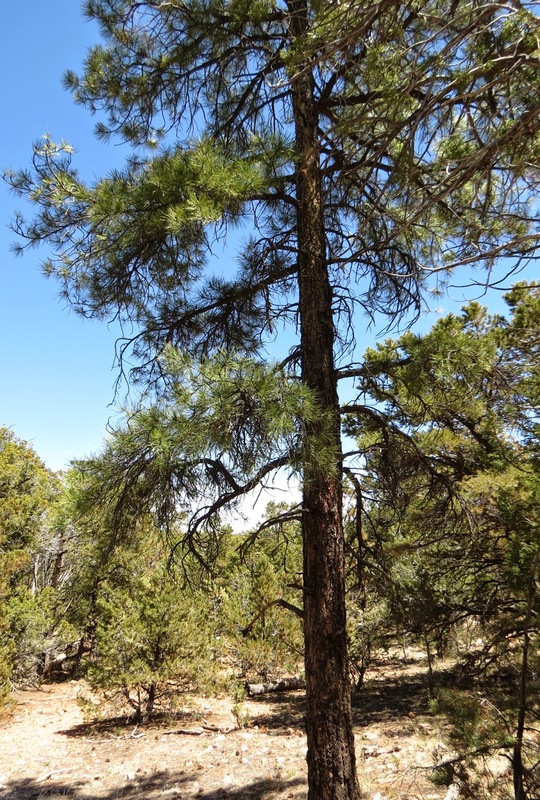 Pinyon Pine:Wood for building materials and fires, nuts eaten, sap waterproofed baskets. Ponderosa Pine:Trunk was used for main beams in Pueblos, needles woven into baskets, nuts eaten. We happened to be here in time for the Ranger Program, so stayed for that. View from Moran Point, named after landscape artist Thomas Moran, who spent every winter in the Grand Canyon from 1899 to 1920. Another artist was painting here today. I call this the Titanic pose. And we know what happened to the Titanic. At Grandview Point we found the snake. He is long, but harmless. 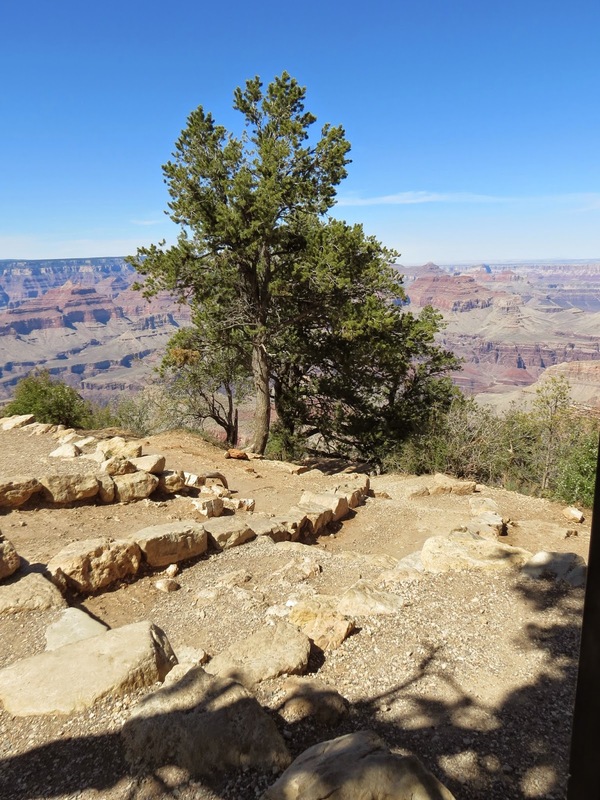 There once was a lodge at Grandview Point...one of the first tourist destinations along the rim. Grand View Hotel was built in 1898. You arrived here after a bone-jarring 12-hour stagecoach ride from Flagstaff. And the next day you took the mule-ride down Grandview Trail. Grandview Trail was a mining trail that led to the old mines on Horseshoe Mesa. The trail did not go all the way to the river. Today it connects to another trail that will take you to the river. More grand views and spectacular scenery.